A baby chick is born and thinks the sky is falling down. On the way to tell the King, she meets Henny Penny, Ducky Lucky and Turkey Lurkey, but there’s a shocking surprise! Chicken Licken grows up to be the Little Red Hen and asks her friends to help her make bread, but no one wants to play! 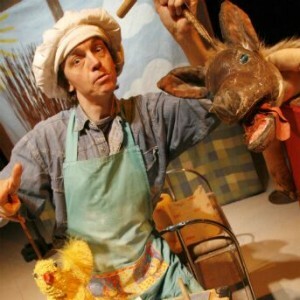 Mixed into this recipe of food, puppets and music is the story of Little Red Hen and the sly Foxy Loxy. Will she outwit him and save her stuffing?